Arrival at Trivandrum Airport/Rly Station, the capital city of Kerala. After refreshing, proceed for a day trip to Shree Padmanaba Swamy Temple, Veli Tourist Village, Sree Chithra Art Gallery Zoo and Museam. In the evening leisure at Kovalam. Overnight Stay at Sagara beach resort at Kovalam. After breakfast proceed for poovar, on the way you can see marine aquarium at Vizhigham, then proceed to Poovar Island and overnight stay at 04 star resort, Estury Island resort, Poovar. After breakfast proceed to Kanyakumari, on the way you can see Padmanaba puram Palace and check-in into the hotel at Sparsa resort, Kanyakumari. 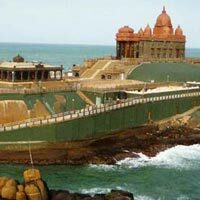 After refreshment proceed for sight seeing, after sunset overnight stay at 04 star resorts, Kanyakumari. After Breakfast proceed back to Trivandrum Town for purchasing. Later drop at airport or Railway Station to board the flight / train and see off by Nissi representatives.